The FPUD150 Series has been discontinued. Please see the FPUD300 Series as a possible alternative or contact our Flow Engineering Department. The new FPUD150 Series drum pump is both labor and cost efficient. 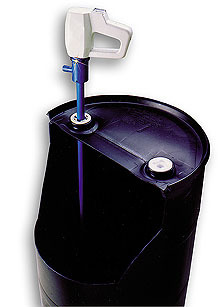 It is the best value drum pump on the market. Designed to replace hand pumps or awkward air-operated diaphragm pumps, it is extremely lightweight and easy to handle. The combination of corrosion-resistant polypropylene tubing and it’s electric motor makes it a perfect choice for intermittent duty chemical transfer applications. 참고: Comes complete with operator's manual. Motors also supplied with power cord.